I have been working with collage since 2009, so about four years now. While I was studying at university (The Arts of London), my love for layouts and putting things together in a surreal way really developed – it was what I was naturally good at and known for in my class. I really enjoy the freedom it gave me. You can be extremely minimal or incredibly complex in your composition, and the final product can still look interesting either way! 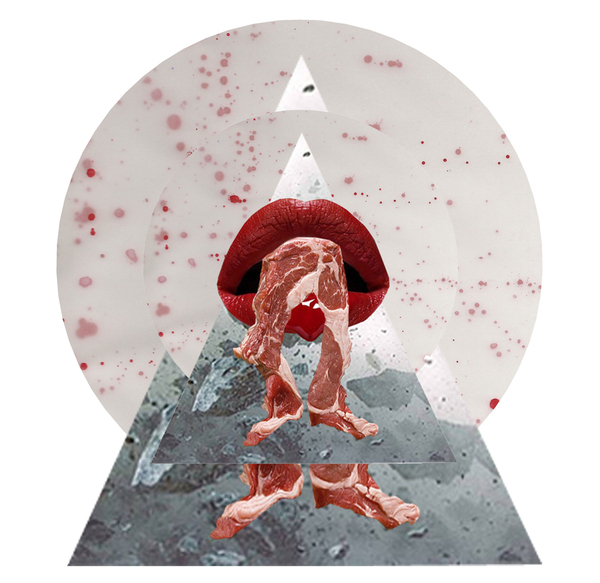 My style of working is solely focused on collage – hand-crafted or digitalised. However, I sometimes like to add different mediums in my works. For example, I worked with embroidery in my ‘Middle of Hill‘ and ‘Lines on Palms‘ projects. Embroidery is something I would definitely like to experiment with again, as well as other mediums such as paint, drawing or even, three-dimensional compositions. When you begin working on a new collage (set of collages), do you already have a picture in mind of how it should preferably look when finalised? Absolutely – I have a little moleskine, where I sketch or jot down new ideas. It’s always best to have a rough idea of what you want your project to look like! I tend to be quite freeform in my transition from the initial design to the final product. I love the playfulness of moving things around and seeing what works best. Again, this goes back to the freedom in which collages gives me. Using and depicting ordinary pictures and turning it in to something really beautiful or fascinating. As well as this, collage is a great technique for telling stories, or creating visuals inspired by music, books or films. In art, what is your favourite époque / your favourite art movement, and why? I simply cannot choose one ultimate favourite artistic movement, there are too many great styles out there! I undoubtedly love abstract works, surrealism, pop art and minimalism. In a way, my works are roughly inspired by these styles. Abstract for one, I really enjoy the edgy-ness, energy and geometric elements that are often used. I really admire the artists of this generation, one being the great Pollock. He and other abstract artists went against the traditional style of painting things in detail, rebellious! Surrealism is another awesome movement that I admire. It was said that Surrealism resolves the previously contradictory conditions of dream and reality which I find really interesting – Dali and Magritte are two of my favourite artists of all time. For me they really changed art and the way we see things by using ordinary objects in an usual context to give new meanings to familiar things. Additionally, I adore Pop art and the likes of – Warhol, Hamilton and Paolozzi. This is the art movement that has inspired me the most. I’ve always been a fan of kitschy objects from a young age, and so this has reflected on the way I work and the things I purchase in every day life. Lastly Minimalism is something I’ve always been a fan of! “Less is more!” As they say and this is something I try to work with in my collages. Plenty! Besides the above, I really admire Gemma Correll and Rob Ryan, the Illustrators. They both have a different and interesting take on art – completely different to collage. Additionally, I take inspiration from Walt Disney, Steve Jobs and Dallas Green – I just really like the way these three work(ed) and their thoughts on the world. Besides from inspirational people, I tend to gather inspiration from nature, vintage markets, kitschy things, my thoughts, quotes, films, musical references and the 1950’s… The list is endless. Music is one of my biggest influences in my works. I’ve done projects inspired by the likes of Deftones and Josh Pyke! I listen to pretty much every-thing. My favourite genres are Rock, Acoustic-Rock and a little bit of Pop-Punk. My favourite bands are City and Colour, Biffy Clyro and Two Door Cinema Club. Ah this is tricky! Nothing that I can think of right now.